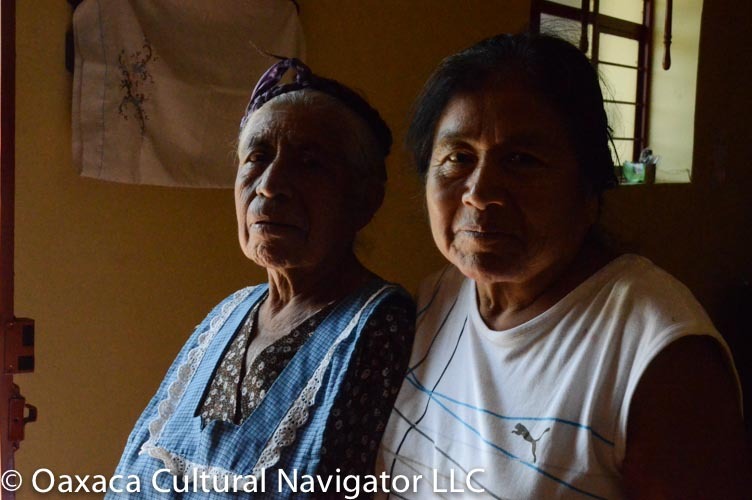 Angelica Guzman is a farmer entrepreneur. Not only is she a great cook. She works the fields to raise crops — garlic, squash, corn, beans — that feed minions. Plus, she houses Mexican students who come to a Tlacochahuaya bilingual university for teacher preparation. 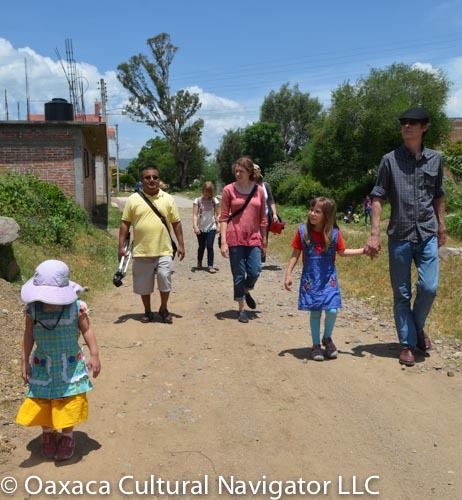 After our morning with her son Moises Garcia Guzman at the Tlacochahuaya church, we walk to the house in the fields where Angelica prepares comida (lunch) for us. Moises reminds me that water is scarce. It is summer, the rainy season. The milpas is planted, but there has been little rain. In some fields, yellowing corn stalks, like flags, wave in the breeze. Federal permits to dig a well are expensive. The government believes crops are thirstier than people. At Angelica’s Casa del Campo there is a well and the corn stalks are young summer green. The cobs will mature for November harvest to feed people and animals. Moises explains that the organic corn planted in this valley adapts to weather conditions. The grain may not be as big if there is not much rain, but there will still be a crop. Not like genetically modified grain which depends on commercial fertilizer and large-scale sophisticated irrigation systems a la Monsanto which the valley farmers resist. Comida is the biggest meal of the day, usually taken between 2 p.m. and 4 p.m. in the afternoon. 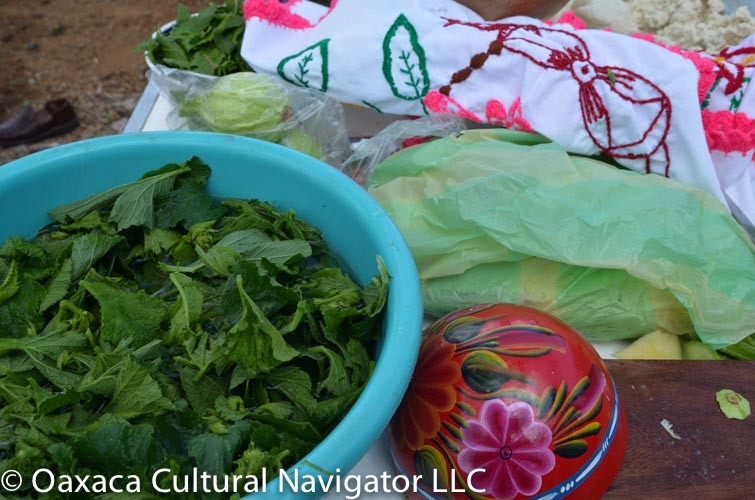 Today, our menu is a traditional Oaxaca repast. 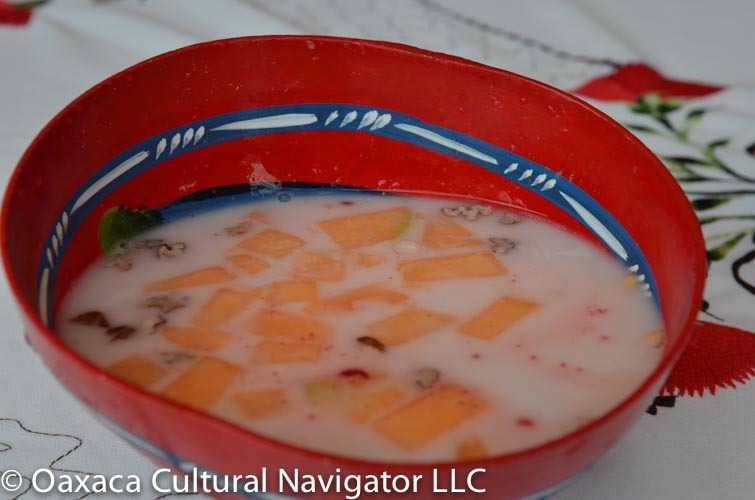 First, the horchata, adorned with walnuts, cubes of cantalope melon, and tuna (the red fruit of the nopal cactus). 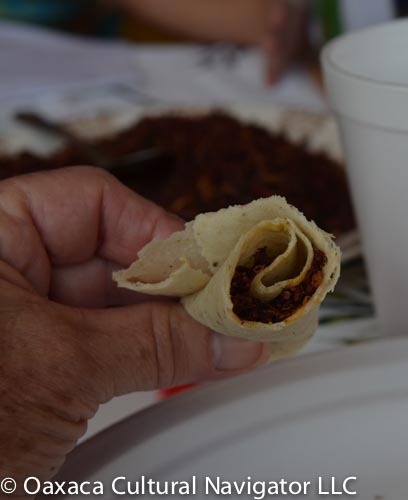 Then, a botano (snack) of fresh off-the-comal corn tortillas that we fill with chapulines. 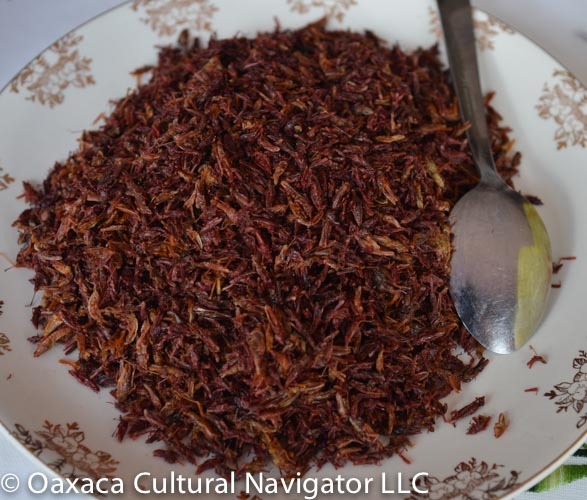 Click on chapulines to see what we are eating! 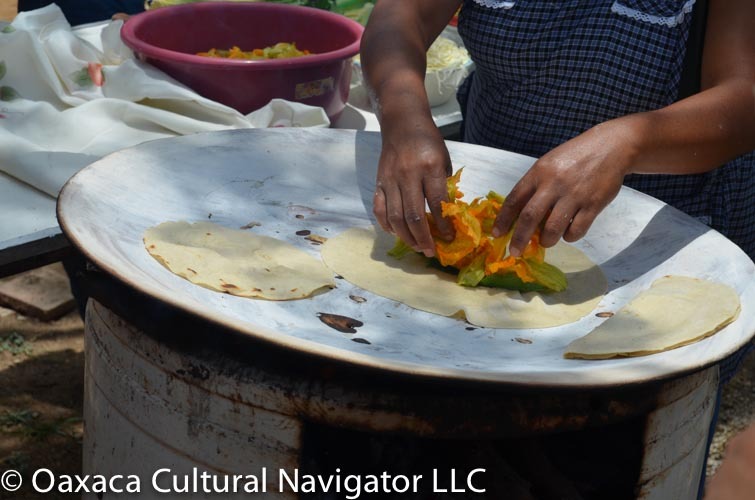 Next comes the quesadillas al comal stuffed with squash blossoms and quesillo. If that wasn’t enough, Angelica brings us platters of grilled tasajo — thin-sliced, seasoned and grilled beef, and beef chorizo. 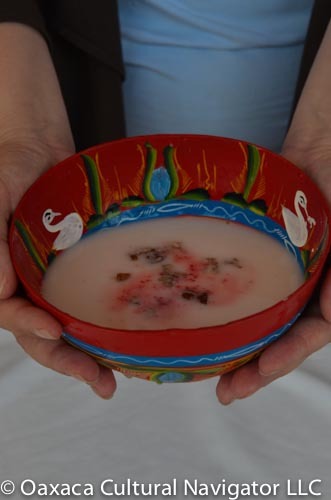 And, then, the dish from the campo that all Oaxacans love — Sopa de Guias (gee-ahs). 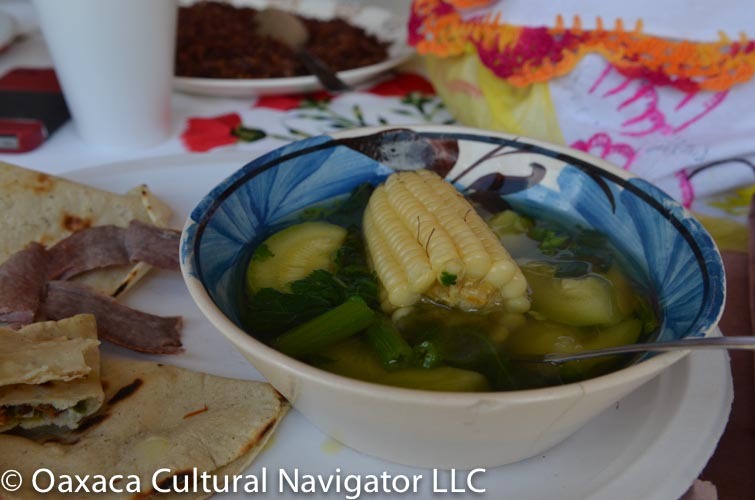 Sopa de Guias, sometimes called squash vine soup, is a vegetable stew of squash, squash blossoms, the tender new green shoots of squash before it fruits, and the squash plant greens, with an ear of corn cooked in the broth. It is delicious. It was all I could do to waddle after giving thanks and saying goodbye late in the afternoon. 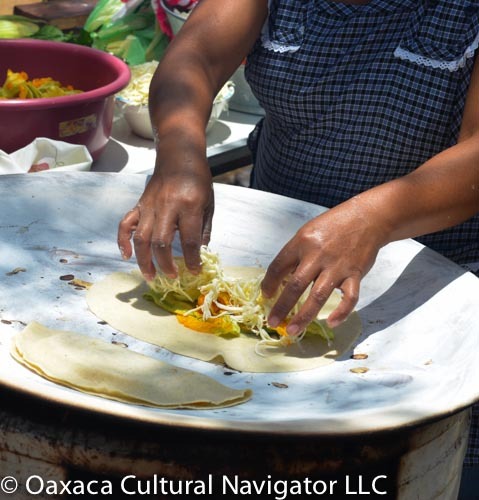 Eating and visiting in Oaxaca is an all-day affair. 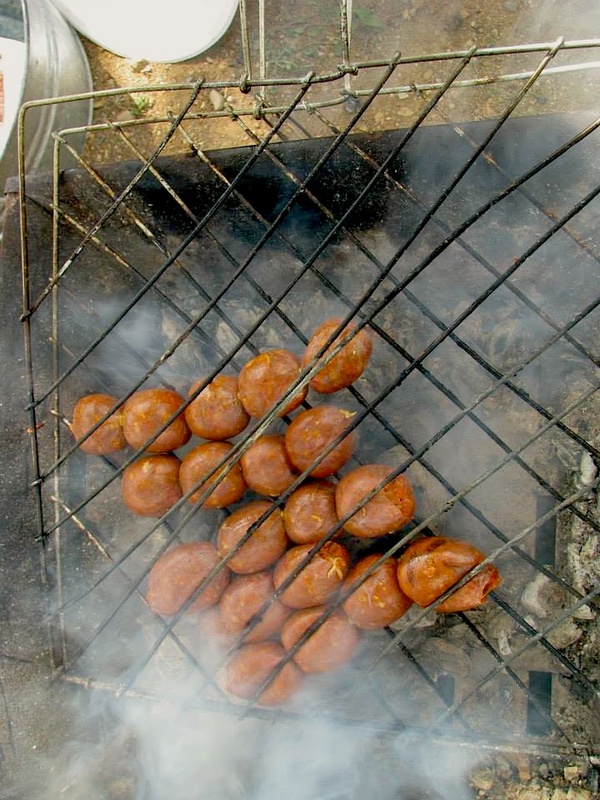 This entry was posted in Cultural Commentary, Food & Recipes and tagged chorizo, grilled pork, lunch, meat, menu, Mexico, Oaxaca, sopa de guias, Soup, squash, Tlacochahuaya. Bookmark the permalink.